Most Well-Behaved City Dogs Ever!! This will make me horribly unpopular in Portland, but I’ve grown to dislike many of Bridge City’s dog denizens (and their owners). Why? Well, my daughters have been bitten by dogs, blind-sided, knocked over and tackled by dogs (especially scary when my girls were first learning how to walk), they have had their toys and balls stolen and destroyed by dogs while at various parks, I’ve watched dog owners let their pets trample through newly planted beds in my front yard with nary a word…I could go on and on. Anyway, in every case, the dog owner couldn’t have cared less. If I had let my kids run amok in the same way, they would be in child protective services instead of Argentina right now!! Needless to say, our experiences in Portland have made me grow to dislike the city dog immensely. Until Buenos Aires, that is. 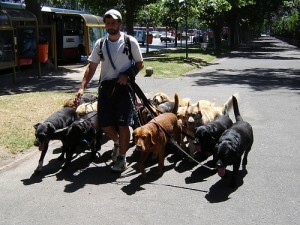 There are a zillion dog walkers trolling around the city, each holding 8 to 16 dogs at a time. The dogs don’t bark. The dogs don’t pull on their leashes. The dogs don’t run after kids, cars, or cats. The dogs don’t fight with each other. They are a rather happy, well-behaved lot. And, a last comment on the ubiquitous dog poop in the street. I have, gasp, seen some dog owners picking up (which is unheard of here), and, at the very least, they try to doody out of the way along the edges of the sidewalk! Photo by Flickr user vtveen used under a Creative Commons license. This entry was posted on Thursday, October 30th, 2008 at 12:00 pm. You can follow any responses to this entry through the RSS 2.0 feed. You can leave a response, or trackback from your own site. Yeah, I have noticed this too! How does that happen? Perhaps they are socialized as puppies by these walkers? It is amazing. I liked your post on the dog walkers, but I had to post myself so I could include my rant!!! I mean, that is what a blog is for–hee hee.